Buckled hats, golden leaves, roasted turkeys and steaming ears of corn. Hardy Pilgrims and noble Wampanoag tribesmen sharing hard-earned food in a mutual gesture of thanks for the bounty bestowed upon the table. No myth has a hold on the American collective imagination as the myth of the First Thanksgiving. It predates all political and military founding stories and conjures images of an innocent, pastoral past. In our case, reading between the lines of the first legendary Thanksgiving menu might yield a surprising new interpretation of what it means to be American. 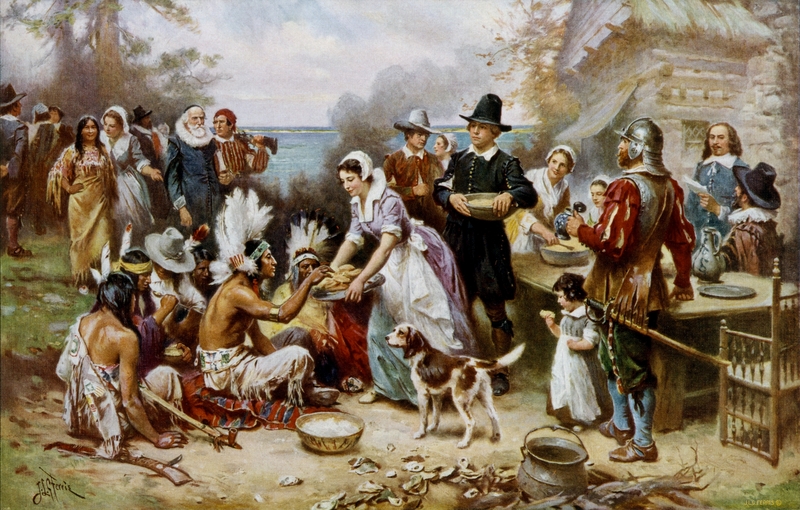 On the First Thanksgiving at Plymouth Plantation, we are told, Governor William Bradford and the Pilgrims were joined by ninety members of the Wampanoag Confederacy led by their sachem Massasoit in an outdoor feast celebrating the autumn harvest. Following the infamous First Winter, which felled many brave Pilgrims, an English-speaking native named Squanto taught the distraught Colony how to plant corn in the Wampanoag fashion. His simple lesson saved them from starvation. The three-day-long feast was thus meant to thank God and the Wampanoag people for a bountiful harvest and has today come to symbolize an instance of intercultural harmony and dialogue. So what exactly was Squanto supposed to have taught the Pilgrims? While there is much debate, a common version of the myth tells us that Squanto taught the Englishmen a Native American agricultural practice called the Three Sisters, a polycultural technique involving the planting of squash, beans and corn in close proximity. The three different plants bring mutual benefits to each other allowing them to grow faster and healthier than if on their own, while simultaneously providing excellent sources of protein, carbohydrates and other essential micronutrients. Thus, if we are to believe the First Thanksgiving myth, the Pilgrims would not have survived another unforgiving New England winter without the Wampanoag’s lesson in agroecology. Ironically, today some insist that industrial agriculture is quintessentially American. They assert that chemical-intensive and GMO-powered giant farms are the only actors capable of feeding the world. But what if these views are the real myths? The sustainable alternative to industrial agriculture is here; it is grounded in scientific research and has proven to work. Moreover, agroecology may be traced back to the original cultures of the Americas. So this Thanksgiving let us celebrate what we know is not a myth: that ancient wisdom that made this great holiday possible in the first place.